Across the historic vineyard regions of Italy, distinctive wines deeply rooted in their landscapes and cultures are waiting to be discovered by wine lovers in the United States. Here are a few to inspire your exploration. Piedmont: A free chart offers an alphabetical list of all Piedmont wines reviewed for the tasting report in this issue. California Rhône: A free chart offers an alphabetical list of all California Rhône wines reviewed for the tasting report in this issue. Ancient Grapes, Modern Wines, Cultural Treasures - Italy is a rich source of pleasures, vinous, culinary and cultural. But even the savviest of wine lovers may not have discovered all the country has to offer. In this story, we explore six grapes with centuries of Italian history, all of them quietly flourishing and making distinctive wines in vineyards less-traveled. You’ll also find lists of recommended wines, and for those inspired to visit these regions we’ve included profiles of exemplary restaurants and heritage sites. FREE: Piedmont Alphabetical Listing - More than 635 wines were reviewed for this report. WineSpectator.com Members can access complete reviews for all the wines tasted using the online Wine Ratings Search. WineSpectator.com: Video Lamb Chops and Nebbiolo: Get the free recipe and video for lamb scottadito with artichokes. FREE: California Rhône Alphabetical Listing - More than 400 wines were reviewed for this report. WineSpectator.com Members can access complete reviews for all the wines tasted using the online Wine Ratings Search. WineSpectator.com: VIDEO California Rhône Rock Stars: Four top winemakers talk Syrah, Grenache and more. New World Values - Whether you're seeking familiar favorites at accessible prices or hoping to explore new styles without breaking the bank, here are 100 bottles that deliver the goods. WineSpectator.com: Wine Spectator's Free Xvalues App: Get our newest most highly rated, easy-to-find value wines! WineSpectator.com: The World's Best Restaurants For Wine: Find more than 3,700 Wine Spectator Restaurant Award winners. 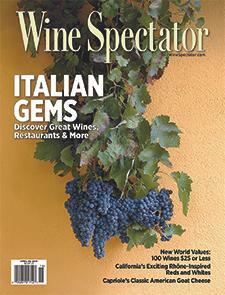 WineSpectator.com: Collecting Newsletter: Our free e-letter features top wines, collecting Q&As and more. WineSpectator.com: Find out more about this intriguing pairing—and get the recipe from executive chef and partner Chris Royster of the grand award winning Flagstaff House in Boulder, Colo. Get it for free and watch a video clip—about the pairing. SPRING ENTERTAINING Celebrate the change of seasons with fresh new recipes from some of the country's best chefs. Whether you're celebrating Passover, Easter, a birthday or an anniversary, we'll make it easy and delicious, with meals just right for milder weather and our editors' picks of highly rated wines. PRIVATE GUIDE TO DINING Our free, twice-monthly email newsletter spotlights the best restaurants for wine lovers, from bucket-list destinations to perfect pizza places. Get great wine picks for dining out, keep on top of drinks trends, learn about new restaurant openings and more. Sign up! Wine Spectator VIDEO Watch all our informative wine tips, winemaker interviews and tastings on your desktop, laptop, tablet or phone. A Perfect Match: Pork Tenderloin with Grenache: Find out more about this delicious pairing and get the recipe from chef Chris Royster of Flagstaff House in Boulder, Colo.
2018 BORDEAUX BARREL TASTINGS Coming soon: The 2018 growing season got off to a rough start, but ideal autumn weather has vignerons optimistic for an excellent if small crop. Senior editor James Molesworth makes his annual trip to taste the young wines from barrel this spring. Which 2018s will be worth buying as futures? Look for his upcoming reports highlighting top châteaus and estates to watch. Plus, get his scores and tasting notes for hundreds of Bordeaux reds, dry whites and sweet wines. 385,000+ WINE REVIEWS We've hit a new milestone in our online library of expert wine ratings. Use our powerful search to find the latest scores and tasting notes (we blind-tasted more than 15,000 wines in 2018 alone), check the recommended drink window and latest auction prices on your cellared wines.